A clementine is a variety of mandarin orange (Citrus reticulata), named in 1902. The exterior is a deep orange colour with a smooth, glossy appearance. 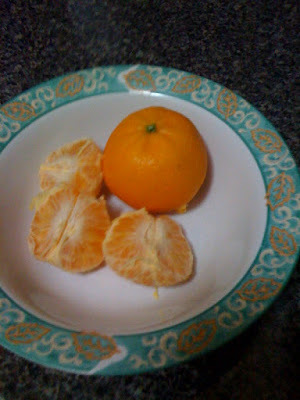 Clementines separate easily into seven to fourteen moderately-juicy segments. They are very easy to peel, like a tangerine, but are almost always seedless. Clementines are, thus, also known as seedless tangerines. The traditional story is that it was "originally an accidental hybrid said to have been discovered by Father Clément Rodier in the garden of his orphanage in Misserghin, Algeria." However, there are claims it originated in China much earlier. And, Clementines lose their desirable seedless characteristic when bees cross-pollinate them with other fruit.